The Asia Pacific Regional Internet Conference on Operational Technologies (APRICOT) is an annual event that brings together Internet engineers and networking experts, government representatives, Internet business leaders, and other interested parties from around the world to learn from training workshops and tutorials, attend technical presentations, discuss policies, and extend social and professional networks with like-minded peers. This year’s event was held in Kathmandu, Nepal from 19-28 February. The Internet Society Asia-Pacific Bureau has a long-term partnership with APRICOT and proudly sponsors its fellowship program, providing financial support for individuals from developing economies to attend the event, and to contribute to discussions about Internet operations, technologies and development. This year the Internet Society sponsored a total of 13 fellows to APRICOT 2018, split between the technical workshops and the conference week, depending on their areas of interest. 75% of these fellows were females, endorsing our focus to inspire and facilitate the participation of women in the technology sector and to #ShineTheLight! We had an opportunity to meet some of these fellows, to know more about them and their experience as a fellow. 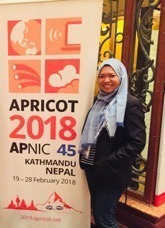 Athirah Rosli is a Doctoral Researcher at Universiti Utara Malaysia, and also a committee member of the ISOC Malaysia chapter. 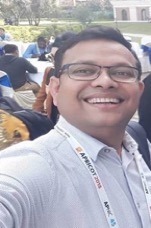 Anand Raje is a board member for India Internet Foundation. He is also vice president of the ISOC India Kolkata chapter. Hsu Myat Thwe is from Magway, Myanmar. 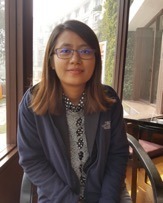 She is a junior network engineer at a local ISP, and also volunteers for Myanmar Internet Exchange Point (MMIX).